As master shapeshifters, druids can take on the forms of a variety of beasts, morphing into a bear, cat, storm crow, or sea lion with ease. This flexibility allows them to fill different roles during their adventures, tearing enemies to shreds one minute and surveying the battlefield from the sky the next. These keepers of the natural order are among the most versatile heroes in Azeroth, and they must be prepared to adjust to new challenges on a moment’s notice. The Druid class is intended to be protector of the wilds, defender of the great balance, and preserver of life, but unless you’re playing on an RP server, I somewhat doubt that you truly plan on doing anything aside from laying some major smack down on everything from mobs, when leveling, to other players in the arena, to bosses in raids. Let not the (relatively) low population of Druids sway you from your interest. Druids are one of the most fun, inventive, and overall powerful (overpowered?) classes in the game, and for good reason considering how the class is designed. Before Cataclysm the choice of race for a Druid was a “difficult” one: Tauren or Night Elf? Now, there are four races. 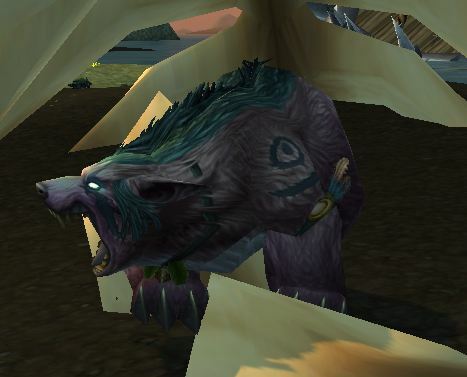 Cataclysm allowed the Worgen and Trolls to become Druids. Mists of Pandaria makes no changes to races or racial abilities and there are no Pandaren Druids. Increased health (about 5%) is a nice plus. +2% Critical effect on attacks and heals. Can periodically move quickly, more movement is always nice. Increased crit chance is nice. Regeneration doesn’t matter with your heals. XP increased Vs beasts, all 5 million of them, which is nice while leveling and nevermind at the level cap. Reduced duration of movement impairing effects, useful for most, but your shapeshift is a far superior “break free” ability. Shadowmeld has situational use. You fade away, dropping aggro, but must remain stationary. As a Tank you can decide that your grouip is worthless, ‘meld, and let the boss kill them. DPS and Healers can meld if the mob decides to pay attention to you. In PvP it can be used in combat (and then prowl away) or to break incoming spells by ‘melding just as the spell is launched. 2% dodge is a nice ability for bear tanks and PvP cats. Wist form for faster movement while dead seems like a singularly useless ability. +1% Crit by day changes to +1% Haste at night. Druidic abilities cover a lot of ground. This is exactly where the druid class differentiates itself from all others: multiple trees of abilities designed to be utilized by the various forms. Druids will find their capabilities both enhanced and hindered based upon which form they’re currently using making proper preparation the key to effectively combating various opponent types, whether player or monster. Overall the experienced Druid gains the instinctive insight of when, where, and how to use his vast arsenal of abilities, making them nigh invulnerable to any combination of attackers and deadly despite any apparent disadvantages. This huge variety of capabilities also makes the class rather difficult to pley well. The standard caster, or humanoid, form for druids is the form you’ll be using for everything from ranged caster style damage and nuking to playing the healer and supporting everyone else in your party. This form is useful at times, due to not being classified as a beast like all other forms. The beast forms make the Druid vulnerable to Scare Beast and various other attacks against beasts. Humanoid form also allows you to look pretty as opposed to looking like a wild animal. Unless you’re Tauren. Cat form is the Druid’s first step on the road to melee DPS capabilities, giving us a massive increase in burst damage, damage over time, and kill speed efficiency as we gain the ability to grind for lengthy periods of time without stopping for mana. Additionally, this form grants you the ability to stealth, very much like a rogue, as well as possessing a sprint like ability and various stealth-opener attacks that allow you to very quickly burn down the opposition. Cat form is immensely useful in making the druid a fast leveler compared to the slower speeds granted by the other forms. Bear form represents a large increase in our survivability, massively boosting armor and health to levels matching that of Warriors and Paladins early on. 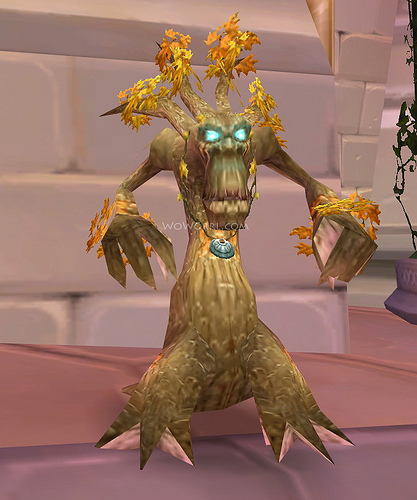 Gaining this form becomes possible at level 8 and used to require the completion of a specific Druid class quest line gained from your respective trainer at either Thunder bluff or Darnassus. No longer. Here’s a complete walkthrough of the (old) Druid bear form quests, for the Alliance Druid and for the Horde Druid. Remember that these quests are totally optional. Travel form is an ever useful speed increase that, despite what you might think, is never fully replaced by either the level 20 mount or the 40 epic speed mount, this form being key to any PvP strategy due to its massive increase in maneuverability over normal players. Very prevalent in Warsong Gulch and Eye of the Storm due to the capability to carry the flag while in travel form, much like shamans. However, this remains undispellable, unlike the Shaman’s Ghost Wolf. Druids also gain a flight form equal to the flying mount. This form also comes at a fairly cheap trainer price and does not require you to train the flying skill itself to use this. However, to obtain the upgrade form, Swift Flight Form, you’ll need to train your riding skill up to 300. The upside is that flight forms can be activated while falling, and at any other time, instantly, as long as you’re not in combat, making it somewhat more viable than mounting up. Moonkin form is gained by picking the balance tree, gaining the ability to shift into Moonkin much like you would any other form, such as bear or cat form. However Moonkin also has greatly differing abilities: rather than add whole new spells, it instead greatly augments armor and damage casting capabilities. Essentially Moonkin could be considered the mage or warlock form, granting us enough Spell Haste (5% to both us and the entire party) and damage (increased Arcane and Nature) to become a reasonable threat from a distance, whether it be grinding, raiding, or PvP. Although the uses of Moonkin form for leveling are debatable, it’s become a staple raiding class, commonly there being at least one or two per raid. With Mists of Pandaria it’s also a viable PvP choice, at least in the Battlegrounds. Any spec of any Druid can pick any one talent from any row, for six at level 90. Talents can be switched easily, just like glyphs, and that can be done while in the raid or battleground. Need to switch a talent for a particular fight? You can easily do it. Your trainer can still reset them all for you, as well as let you access a second spec. Feline Swiftness – 15% movement speed bonus. Displacer Beast – Activates Cat form, teleports you up to 20 meters forward, and briefly increases movement speed. Wild Charge – The exact effect depends on your spec, but generally gives you a brief movement burst or charge. Ysera’s Gift – You are constantly healed for 4% every 5 seconds, if you’ll full up then an ally will be healed instead. Renewal – Instantly heals the Druid for 30%. Usable in all shapeshift forms. Cenarion Ward – Protects a friendly target, causing any damage taken to heal the target every 2 sec for 6 sec. Gaining the healing effect consumes the Cenarion Ward. Useable in all shapeshift forms. Faerie Swarm – Adds a snare to Fearie Fire, reducing the target’s movement speed by 50% for 15 sec. Can snare more than one target. Mass Entanglement – Roots your target and nearby enemies. Typhoon – Summons a Typhoon that strikes targets in front of the caster, knocking them back and dazing them for 6 sec. Useable in all shapeshift forms. Balance (link) – More damage from Solar or Lunar empowerment. Feral (link) – Your finishing moves provide 4 energy for each combo point used. Guardian (link) – Mangle generates more Rage and does more damage. Restoration (link) – Casting Swiftmend improves the next cast of various spells. Incarnation – each spec has access to a different talent, each lasts 30 seconds. Balance: Chosen of Elune – Increased spell damage for 30 seconds. Feral: King of the Jungle – improved Cat Form allows use of Prowl in combat and causes Shred and Rake to function as if stealth were active. Lasts 30 sec. Guardian: Son of Ursoc reduces the cooldown on Growl as well as on all your melee abilities. Restoration: Tree of Life provides more armor and better spells. Balance (link) – … root your target and cast Wrath at it. Feral (link) – … root your target and melee it. Guardian (link) – … taunt your target and attack it. Restoration (link) – … cast Swiftmend on your current target and then use Healing Touch on it or a nearby ally. Incapacitating Roar – Invokes the spirit of Ursol to roar, disorienting all nearby enemies. Any damage caused will remove the effect. Useable in all shapeshift forms. Ursol’s Vortex – Conjures a vortex of wind at the destination location that reduces the movement speed of all nearby enemies and will pull them back into the vortex if they try to leave. Useable in all shapeshift forms. Mighty Bash – Invokes the spirit of Ursoc to stun the target. Useable in all shapeshift forms. Heart of the Wild has various effects, depending on your spec, lasts 45 seconds, and has a 6 min cooldown. 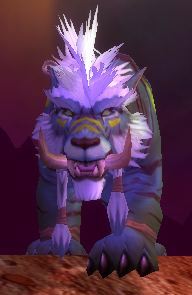 Best used when you regularly use abilities not particular to your spec, such as casting or healing while Feral. Not so useful if you never use those secondary abilities. Balance (link) – dramatically improves your ability to tank, deal melee damage, and heal, while in Cat or Bear form. Guardian (link) – Better casting, healing, and more damage while in cat form. Restoration (link) – increases all healing done by 35% and greatly improves your ability to tank, deal melee damage, and cast spells, while in Cat or Bear form. Dream of Cenarius – Improves abilities, which ones depend on your specialization. Balance (link) – Your Solar and Lunar peaks can your Sunfire and Moonfire spells to heal an ally. Feral (link) – More effective Rejuvenation and Healing Touch and both also heal you when used on someone else. Guardian (link) – More healing from your Healing Touch, higher Crit chance for Mangle, and your Mangle crits greatly improve your next Healing Touch or Rebirth. Restoration (link) – More Wrath damage and your Wrath also heals a nearby ally. Nature’s Vigil – Increases all damage and healing for a short time. While active, all single-target healing spells also damage a nearby enemy target for some of the healing done, and all single-target damage spells and abilities also heal a nearby friendly target for some of the damage done. Each spec gets a completely different set of talents on this tier. Euphoria – Reduces Solar/Lunar cycle time and the cast time of certain spells. Stellar Flare – Blast the target and also does damage over time, best used when you’re balanced. Balance of Power – Your direct damage spells extend and enhance your Moonfire and Sunfire spells. Lunar Inspiration – Moonfire is now usable in Cat form and generates a combo point. Bloodtalons – Casting your Healing Touch causes your next two melee attacks to do +30% damage. Claws of Shirvallah – This form allows you to cast any non-damage spell and increases your Versatility by 5%. Guardian of Elune – Your Savage Defense now lasts half the time, but has a much higher dodge chance. In addition, the cooldown time is significantly reduced. You also get +10% Dodge chance at all times. Pulverize – Consume Lacerate stacks to smash the target and reduce your damage taken for 12 seconds. Moment of Clarity – Your Omen of Clarity now lasts 7 seconds, instead of one cast. Germination – can apply Rejuvenation twice to the same target and all Rejuvs last 3 seconds longer. Rampant Growth – +20% healing to your Swiftmend, removes the cooldown, but it now consumes your Rejuvenation or Regrowth on the target. Druid Abilities in Warlords, by spec. It used to be that the talents defined your specialization (spec,) beyond a couple of core abilities. In Mists of Pandaria and beyond it’s the abilities that define your spec, not the talents. These are the abilities that differentiate you from the other Druids. The abilities that are shared by all specs can be found here. Perks are enhancements to certain abilities. You gain these post level 90 in leiu of new abilities. All the perks are passive and all are learning in random order. You get one random perk at levels 92, 94, 96, and 98. At 98 you’ll have them all. Gearing woes will plague you throughout your career as a Druid. One of these woes will the the idea of maintaining several sets of gear, one for each role that you want to play. For PvP for any Druid: PvP Power is as good as, or better than, your primary stat. The linked pages have much more detail on appropriate stats. Stamina Note – at low levels we recommend that you stack Stamina until survival is no longer an issue (which will be different amounts for different people.) If you’re doing low level PvP (or any PvP) you’ll want a lot more than otherwise. In a PvE environment, if you’re DPS and have a good tank, then you don’t need much Stam. PvP Note: Warlords did away with Resilience and PvP Power on high level gear. Both still exist on PvP gear that’s level 90 and below. Both are still useful at those levels. Resilience reduces damage done to you by other players. PvP Power adds to your damage and healing to other players. What does this mean for gemming and enchanting for PvP? Gem the same as for PvE, for max damage or healing. Keeping up with the best gear will require gold, and a lot of it. Keeping up with “good enough” gear is much cheaper. PvP gear requires no gold. PvE drops require no gold, but the repair cost is higher and you have to be pretty lucky (or determined) to get a full set. Go here to check out an addon that will help with the gold, otherwise work your gathering skills (herbs, ores, skins) hard until you have the gold. Low level: Stack Stamina until you’re happy with your survival chances. You can get it through gear with Stamina, enchants (often very cheap on the Auction House,) Stam scrolls, and foods. Pre-level 70: Do some battleground PvP (any decent guild will help) and accumulate around 2k honor. At 70 buy the “Brutal Gladiator” arena set, even if you don’t like PvP. It’s an epic gear set that will set you up nicely till 77 or so. You can find the stuff from any of these guys. At level 81 you can probably find Mists of Pandaria blue titled gear popping up on the Auction House. It will be good until level 90. If you have a ton of gold you might be able to find hot gear on the Auction House. 90-100: Grab three pieces of the crafted gear (630 weapon, 640 chest and legs) and keep an eye on your Garrison missions for other nice gear. Any crafted gear can be greatly upgraded with various crafted bits, such as Burnished Essence for your armor pieces. Ashran or the Battlegrounds for Honor PvP gear. Arenas for Conquest gear. Tanaan Jungle for ilevel 650 tokens, which can be upgraded to 695 with enough Apexis crystals. Note: For a more in-depth look at leveling a Druid, including builds, specs, and tips, check out our Druid Leveling Guide. For an actual path to get to the level cap fast, with all the “where to go” and “what to do” stuff completely covered, you should see this page. Balance in second, although gaining slightly at higher levels, and finally Restoration – a distant third, given that it only benefits healing aside from the first talent (furor.) However, if you’re a team player and are doing most of your leveling in teams (ie: dungeons, battlegrounds) then Resto is quite viable as a leveling build. Guardian is the Tank spec and how it levels, via questing, is an open question. Typically tanks do very well rounding up groups of opponents and burning them down and Guardians do quite well at that. Plus, if you’re willing to be the dungeon tank you will have near-zero wait time for dungeons. Feral druids are focused on becoming Rogue and Fury Warrior-like in that they burst through mobs in a whirlwind of flashing claws or death and destruction, stopping only to throw on a few HoT’s (Heal over time) before shifting back into cat form and moving onto the next group. Downtime is almost nonexistent the more you progress past 20, firmly becoming nonexistent past 40+, as you gain some of the massively damaging attacks that define feral druid and cat form DPS. See our Druid Leveling Guide for builds and specs on leveling a Feral Druid and see our Feral page for more general info on that spec. With Mists of Pandaria the fourth Druid spec is the Guardian, the tank form. Like most tanks Guardian is fine for leveling, with slightly different tactics. While the cats will go from opponent to opponent and destroy them, one by one, you’ll round them all up and burn the whole group down at once. Probably without taking a scratch, certainly nothing that you won’t be able to heal. Tanking can be quite an enjoyable experience. Bear form easily gives you the capability to hold threat while whoever you’re teaming with beats the offending mobs down. With near zero wait times for dungeon queues you’ll move quickly. Leveling as Balance is the second option when setting yourself along the path to 90 (or whatever your goal happens to be.) 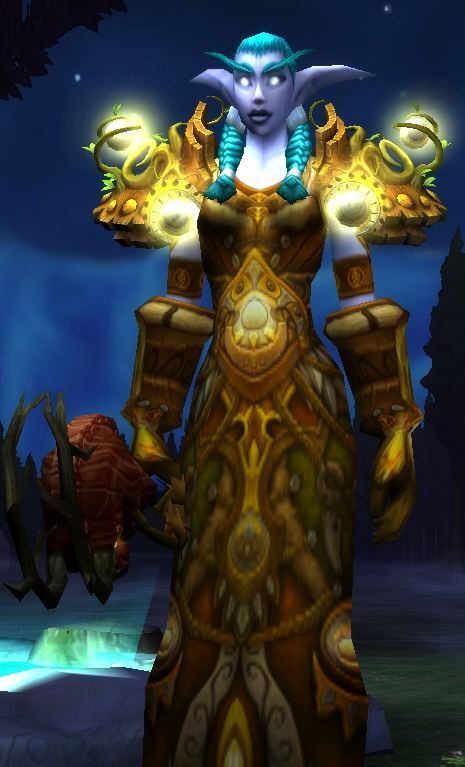 I personally selected balance as my build of choice when leveling my first druid to 70 (back when 70 was the level cap.) I found it more fun to play a unique hybrid caster as opposed to another rogue clone with heals. Stacking up as much damage gear, and good gear in general, is key to being viable as Balance. Balance is also good support for a group of players leveling together, giving you the ability to deal out the damage and remain in reserve for heals when needed. Restoration leveling is an exercise in patience and exasperation, you gain virtually no improved solo capabilities while improving your already powerful healing capabilities to pointless levels, as far as soloing is concerned. Only consider this build if you plan on dedicated teaming. The upside would be that you provide massive aid to any team you happen to join and, if instancing regularly is your thing, it actually comes in quite handy and sets you apart from any other Druids you might encounter. If you have 1o gold and are level 30+ you can pick up the dual build ability from your trainer and have one build for Feral and another for Resto. See our Druid Leveling Guide for builds and specs on leveling a Resto Druid and see our Restoration page for more general info on that spec. Are Druids viable in PvP? I think enough of us have had our butts kicked by Druids to know that that is a silly question. Druids are very viable in PvP, any PvP. For builds and info see our Feral Cat PvP, Resto PvP, and Balance PvP pages. For all kinds of Druid PvP info, including “how to,” builds, techniques, info on Arena, BGs, and More, see Skill Capped. It isn’t free, it’s a grim $4 per month, and has a ton of info on Druids. Skill Capped is constantly updated with new content and videos and techniques. Check it out. If you’re just looking to make some gold, as opposed to crafting items, Herbalism works very well .Combine this with another gathering skill such as Mining or Skinning. It makes for a mean money maker combo and you’ll likely never be left wanting for more gold, except perhaps to buy that expensive top level purple gear on the Auction House. Even though you have your own heals the first aid skill can still come in handy from time to time, especially at lower levels. (Never underestimate the benefits of a free heal.) It’s pretty easy skill to level, with all the cloth drops, and it does have the occasional use. Generally speaking, the crafting skills are very expensive to level. If you have lots of gold already then go for it, otherwise wait until you do. Profession bonuses are gone in Warlords. In exchange, leveling professions in Draenor is much faster, cheaper, and easier than before. Note that the crafted items can be additionally upgraded with Valor points. Powerleveling any of the professions is expensive, so make sure you can afford to level these skills. Engineering: Flexweave Underlay (a parachute) and Grounded Plasma Shield are further cool engie toys. Watch for engie side effects, they might be “interesting” in a dungeon or raid situation. In Draenor you can makes rockets and shields. Leatherworking: All Druids wear leather armor so if you’re leveling you might find this skill to be useful. You can make ilevel 640 armor, upgrade it to 715, and make the items to reroll the stats on that armor. Your garrison Leatherworking minion will let you make tents than increase your stats by 10% for an hour. Jewelcrafting: Make and use nicer gems than the other people get, in addition to useful jewelry. Blacksmithing will let you make mail or plate armor and weapons. The weapons are ilevel 630, can be upgraded to 705, and you can make the bits to reroll stats on those weapons. Alchemy: Make cool potions and trinkets. Enchanting: in addition to the Draenor enchants your garrison Enchanter minion will let you make Illusionary enchants, which let you change the look of your other enchants. Inscription: Glyphs, some trinkets, and some ilevel 630 staves, which can be modified just like the Blacksmithing weapons. Herbalism for the gold or to fuel your Alchemy or Inscription profession. Skinning for the gold or to fuel your Leatherworking profession. Mining for the gold or to fuel your Engineering or Blacksmithing profession. Now that you’re on the way to becoming a lean, mean, killing machine you should consider a full blown leveling guide for your blast to the top levels. Why? It will save you many days of in-game time and will also save a good deal of frustration, even if you already know many or most of the quests. You’ll never again wonder about where to go, what to do, or where to find that thing you’re looking for. 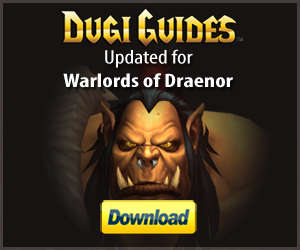 Our recommended leveling guide is Dugi’s Guide. Dugi’s nearly automates the whole leveling path (automatically updating as you complete tasks and quests) and is like having an expert helping you every step of the way. Pick your starting point and the guide automatically updates and advances as you complete quests, sets a waypoint arrow automatically, and includes all the important quest info. If you gain a few levels in the dungeons or in PvP, then come back to the guide, you’re still covered. It’ll figure out where you are and adjust accordingly, allowing you to ignore obsolete quests. Whether you’re brand new to WoW or decked head to toe in heirlooms Dugi will get you to the level cap faster than anything else out there. Grab your copy of Dugi’s Leveling Guide, here.